The music that delights audiences at concerts, musicals, movies, or in recordings… is the product of composers’ and music directors’ hard work and talent. Music directors—also called conductors— lead orchestras, choirs, and other musical groups during performances and recording sessions. They select musical arrangements and compositions to be performed, and study musical scores to prepare for rehearsals. They ensure that musicians play with one coherent sound, balancing the melody, rhythm, and volume. Composers write original music that orchestras, bands, and other musical groups perform. They may also write lyrics. Composers often study different musical styles, though some focus on one genre, such as classical or hip hop. They also may write for musical theater, compose movie scores, or write commercial jingles. Most music directors work for schools and religious organizations, or are self-employed. Performances often require some travel and evening and weekend hours. Composers work in offices, recording studios, or at home. Though they may work anywhere in the country, many jobs are in New York, Los Angeles, Nashville, and Chicago. 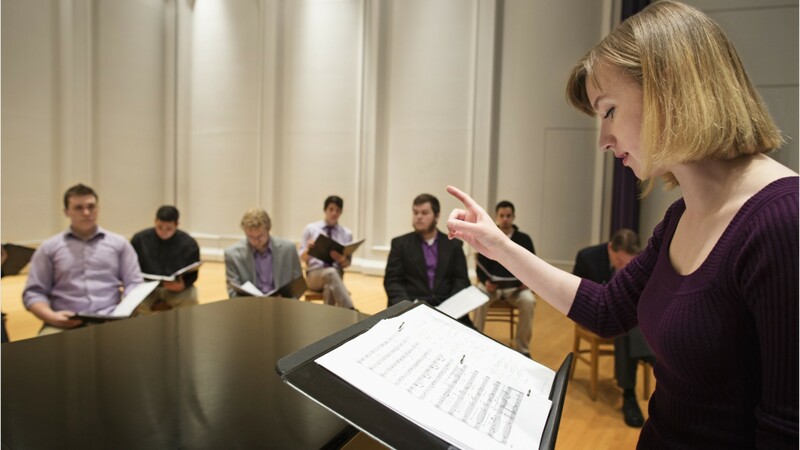 Music directors need a master’s degree in music theory, composition, or conducting; choir directors may need only a bachelor’s degree. Popular music composers submit recordings of their music to bands, singers, record companies, or movie studios. They often post recordings of their music online on their own website, or social media. See more details at O*NET OnLine about music composers and arrangers. Music Composers & Arrangers by U.S. Department of Labor, Employment and Training Administration is licensed under a Creative Commons Attribution 4.0 International License.